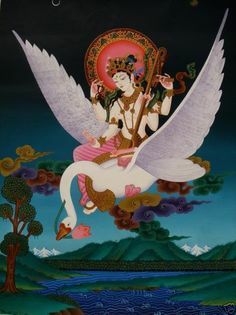 What role does Saraswati Devi play in my Dharma Practice? I drew the Ace of Cups from my deck after asking Her this question. Wonderful, I thought. She’s love. Except that seemed to be an inadequate answer. It certainly wasn’t an answer to the intention behind the question. I am used to My Lady’s jokes and riddles, and used to her telling me that I must figure out answers on my own, but I have also learned that she does not give inadequate answers. The Ace of Cups is often shown as a baptismal font, a communion chalice, or the Holy Grail. One drinks from a cup, and the suit of Cups is the suit of the emotions and therefore of love and relationships. As I flipped through my reference books, I remembered that I use the Page of Cups as my signifier. What does this make the Ace of Cups, then? Quite simply, it is what I hold: in my hands, in my heart, in my mind.